I published already several blogposts on this blog analyzing the Twitosphere is several European and South American countries (see the sidebar). Last week I had a close look at the twitosphere in Canada. The next country analyzed - the first country in Asia - is India. Using the same approach as for the previous countries, I managed to find 1631 active Twitter accounts in India. A Twitter account was considered to be held by someone from India if the location explicitely refers to India or if the Twitter user was located in India according to one of the Twitter mapping mashups. The actual number of Twitter users in India is probably higher as only 50% of the Twitter users specify their location in their profile (see this previous post). For an estimated population of 1.12 billion people (according to Wikipedia), India has 1631 Twitter accounts, meaning that there is a Twitter account in India for every 687,000 inhabitants. Currently for Iceland and the Netherlands there is one Twitter account for less then 10,000 inhabitants. For Canada there is a Twitter account for every 10,014 inhabitants. This graph below shows the history of the Twitter accounts in India. The graph is based on the date of the first message posted on each of the public Twitter accounts in India. 257 Twitter acounts from India or 15.8% have chosen to keep their updates only available to their friends. In the analyzed European countries this percentage varied from 3.5% (Italy) to 22% (Belgium). In Canada 7.1% of the Twitter accounts were private accounts. A Twitter user can choose to follow one or more other Twitter accounts, called "following". 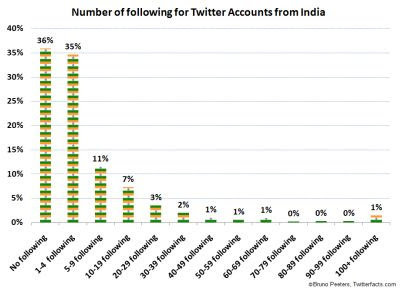 36% of the Twitter accounts in India do not follow other Twitter users. 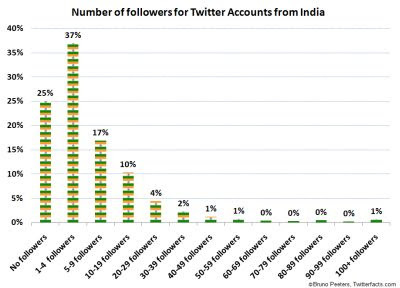 An average Twitter account from India follows 10 Twitter users. An average Canadian Twitter account follows 23 Twitters accounts. In the analyzed European countries this average varied from 9.6 (Belgium) to 32 (Italy). A follower is someone who has indicated another Twitter account as following and receives all updates of that other Twitter account. 25% of the accounts have no Twitter followers at all, meaning that no one else on Twitter has indicated this account as following. An average Twitter account from India has 8 followers. This average is far below the average for Canada (25 followers). 10% of the accounts from India are still waiting for their first update to be published. Currently an average Twitter account from India has 88 updates. This is again significantly lower than the average for the Canadian twitosphere. The top 2 Twitter accounts are non human, meaning that the messages are automatically generated. In other countries I discovered more automated Twitter accounts. 60% of all Twitter accounts from India with a public feed did not post an update in the last 30 days. They can perhaps be considered as inactive accounts. In Canada the percentage of inactive Twitter accounts was 46%. 27% of all Twitter accounts from India with a public feed did post at least one message in the last 7 days, indicating that these accounts are still alive. In Canada the percentage of active Twitter accounts was 38%. 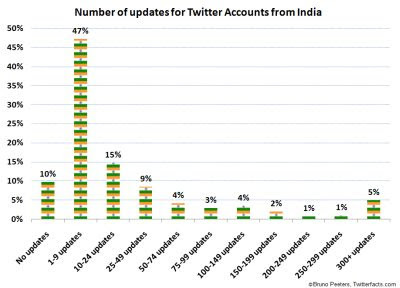 This state of the Twitosphere in India is only a snapshot, meaning that the figures mentioned in this post have already changed because the Twitosphere is a very dynamic environment with several new accounts being created every day, new connections being made between accounts (following/followers) and of course new messages being written every hour of the day. 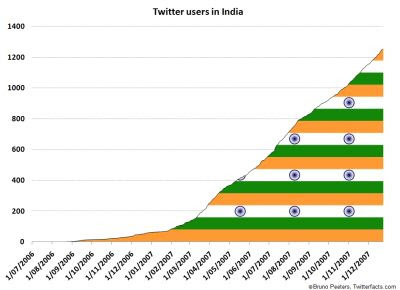 Users from India were among the first to start using Twitter (from July 2006). From March 2007 the growth in the twitosphere in India accelerated. The growth of new Twitter user accounts in India remained at the same speed from March 2007 until now. The degree of activity in the twitosphere in India is lower than in the other analyzed countries. The percentage of active Twitter users, the number of Twitters users followed and being followed, the number of updates (Twitter messages published), the number of non human Twitter accounts are all significantly lower compared to Canada and several European countries. For a country with a huge population (estimated at 1.12 billion), the number of Twitter users is surprisingly low. Especially because India is known for its IT workforce. There are a lot of IT specialists from India working in the USA and in Europe. I have the impression that the IT workforce within India does not use Twitter to communicate intensively with their colleagues working abroad. Interesting post, do you have any studies for Twitter users in the Philippines? The Philippines is supposedly one of the leading SMS users in the world (well, next to China). great article. thanks for this. Very useful. You have just forgotten me. My name is Ronak Shah and I have more than 1300 followers..
Hi, I'm an ethnographer and social media observer based in Mumbai, India and I was wondering whether you have more recent stats on the State of the Twitosphere in India? Do you have list of Indian celebrities on twitter?